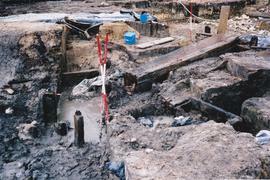 The double horizontal-wheeled tidal mill at Ebbsfleet, Kent under excavation by Oxford Wessex Archaeology. Describes main findings from the excavations prior to building of the Oracle shopping centre. Includes 12th century drawing of a working watermill showing the pit wheel operation. Report on the oat-drying kiln at Melin Tyddyn Du. "Record and Evaluation of the Japanese Potato Washer Mill"
Page n.2. The photograph shows the ruins of the Llangoed Mill (wind mill) in Glenrafon village, Anglesey. 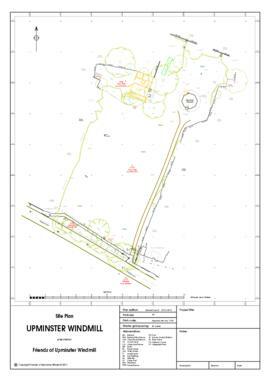 Archive of the Archaeological Buildings Survey Report. Scanned photographs, drawings and text relating to the report. Archaeological dig details of the second Mill House, which was divided into two cottages. Each stage of a dig is recorded and any special details are drawn, as in this example of a doorway in the cottages. The Mill House basement will be filled in and the new visitors centre built on top. To save the details of the basement for posterity, a 3D computer model has been made using actual photographs from the dig site.